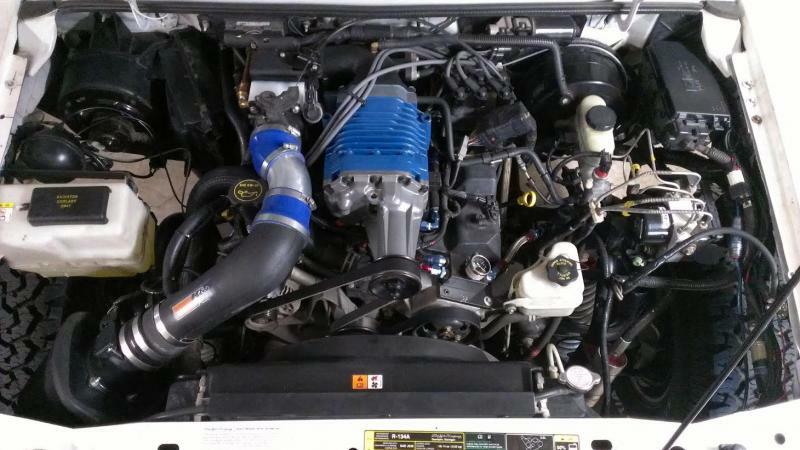 Going up for sale this winter will be my Banshee SOHC 4.0 supercharger kit. After looking into a turbo setup, I got interested and am going to be tackling a custom turbocharger setup instead for a new unique project. Just under 1,000 miles on it and comes with pretty much everything you will need to bolt onto yours. Will come with serpentine belts for A/C and non A/C engines. Comes with detailed instructions, and Ronald at Banshee is great with customer support if you have issues or questions. I'm trying to line up a serious buyer now so I can start buying some components. This kit CAN run on a stock tune, but a custom tune is recommended. To complete the kit, you should buy 30# injectors and a Mustang GT MAF housing; Both available from Banshee. If you are serious, I'll start the disassembly within a month or less. Takes just a few hours to pull everything off. $1300 FIRM. Buyer pays shipping. Are you selling just the kit? Or is a supercharger included? I'm selling everything that you will need to install and be 100% functional. You don't need the injectors or MAF to run it, but for better performance and safety when ran hard other than daily driving conditions, its recommended. You are going to want to get on it once in a while... Getting in the higher RPMs can definitely lean your fuel out with the stock setup leading to damage. So basically, I would just plan on buying the upgrades and playing it safe and getting more power. He sells the injectors and stuff for pretty cheap. You can run it with everything 100% stock if you choose, but getting a tune is highly recommended to prevent issues. If you look at Ronald's site, he drives his truck up to 120 miles/day with everything stock and has over 40k on the kit. That could work if need be. I would make sure to have it off though. Its a good 7+ hour job if you take your time. Adding in pulling it off of mine and we'd have a long day. Kit is all pulled off, ready to sell. Also now included for $175 are the Bosch 30# injectors, the MAF for $100 (Originally $355 total), and The K&N FIPK intake shown (new $240) with exact tubing you need for $175. This means you will only need a tune to have a complete capable supercharger kit that could go beyond the 5.5psi. New price reflected. All of this for $180 more than just the new kit ALONE minus supercharger and all other parts. You get everything pictured. If you wanted a supercharger kit, you won't find a complete setup like this for sale without buying things individually new. SOMEONE JUMP ON THIS AWESOME DEAL SO I CAN GET STARTED ON MY TURBO!!! Wouldn't you still need the fuel pump ? Or is that included ? It definitely wouldn't hurt to upgrade the fuel pump to maybe a 110Lph, but I was running this setup off of my stock one. If I kept it on, I would have eventually upgraded that just to play it safe. They are only $70 or so, so probably a good cheap investment for the long haul.